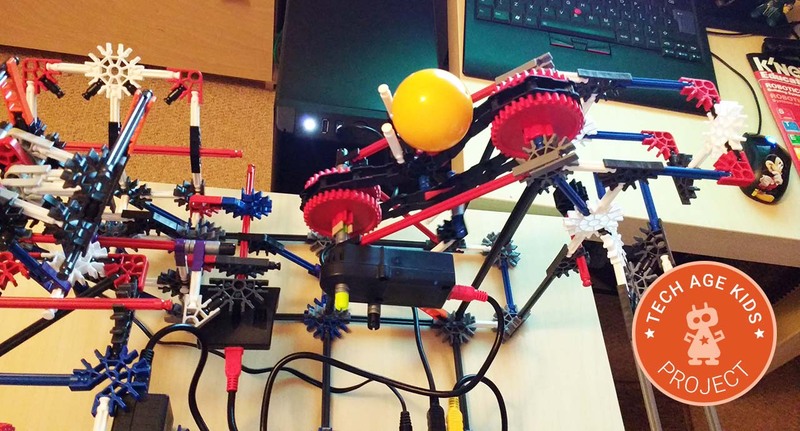 The K'Nex Robotics Ball Factory is the biggest model from the K'Nex Robotics set. We've built it and programmed it and it was a really interesting experience. See our K'Nex Robotics review to find out more about the kit itself. After my son had built the Spyder walking robot he was reluctant to dismantle it - it's a very cool robot. But, the Ball Factory model really caught his eye and he decided to start building it. The instructions don't include any information about what the model does they just show you how to build it. The behaviour of the simpler models is pretty obvious but this one isn't. You need to go to the Teacher's Guide to find an explanation of how the model works. It's a model of a factory production line. Balls are detected and the lifted up a conveyor belt with a very neat mechanism. They then roll down a shoot to a sorting area. Yellow balls are sent along to the next station whereas other colours get dropped through a trap door. Finally a button press triggers a clever collection mechanism which swings the ball back to the start. Before you start building this model you should know that the program to control it is not provided. It's an exercise for the learner. There is some help in the Teacher's Guide but you need to program the behaviour yourself. This is actually the last and hardest model in the Teacher's Guide so you should work through the others first. But my son was keen on this model so we just went for it. The Ball Factory is a big model so my son and I worked on it together. It took a couple of hours with both of us building. It uses the majority of the parts in the kit including all of the sensors and motors. This model isn't included in the printed instructions, it has online instructions which we put up on a large monitor. We actually found this easier that using printed instructions. Some of the pieces are quite hard to snap together (and take apart) but build was reasonably straightforward. 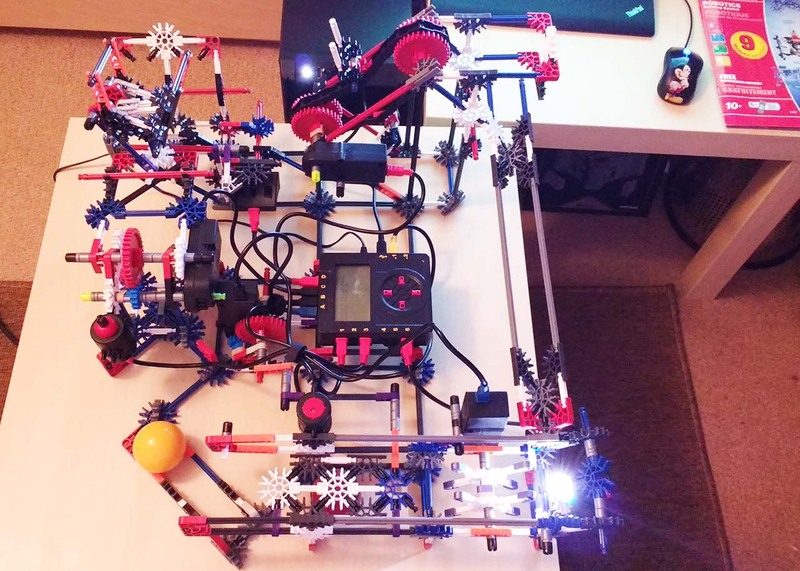 The Ball Factory needs to be coded using the K'Nex Robotics flow chart software. We already had a little bit of experience with this from troubleshooting our first K'Nex model. The Ball Factory has three fairly separate stations that can be programmed independently which is really useful. My son programmed the behaviour without much help from me, mostly looking things up in the manual when something wasn't intuitive. He started with the conveyor belt, experimenting with the direction, speed and duration of the motor until he was happy. Next came the colour sensor. We found that this reported yellow for the green ball and for our hands and reflections. It was quite picky. It worked well in one room but just reported Yellow all the time in another room. We think this must be because of different lightbulbs. As long as we stayed in the first room it could reliably detect the Yellow and Red balls and didn't trigger unless there was a ball. Getting the lifting mechanism working at the next station took a bit of work on the K'Nex model which was initially too stiff to be triggered by gravity. We soon got it going though and it's very cool! Finally we worked on the trapdoor which uses a neat mechanism to turn rotational movement into linear backwards and forwards movement. My son managed to work out the timing on this so it opened the trap door before pushing a red ball and then closed. Our main tip is that there's a checkbox you have to tick to get the program to wait until the motor has finished running before going on to the next step. It was a bit annoying if stations out of sync and their starting position wasn't correct as there's no way to reset the motors or send them to a specific position so he had to change the code temporarily to reset them or in some cases just stop the program at the right time. We were able to test each station of the Ball Factory independently which was useful. It would have been even better if they could have been built independently, but you have to build it all first. We had to make a few adjustments to make sure everything was at the right angle to work correctly. And as we mentioned we did have a bit of trouble with the colour sensor. The colour sensor also points up and it's really bright, you have to be careful not to look at it. Because this model doesn't move around the room we used the main power supply throughout rather than batteries which I really appreciated. The USB cable is much to short to make it convenient to program a model like this. A longer cable would have been very handy. We managed though. 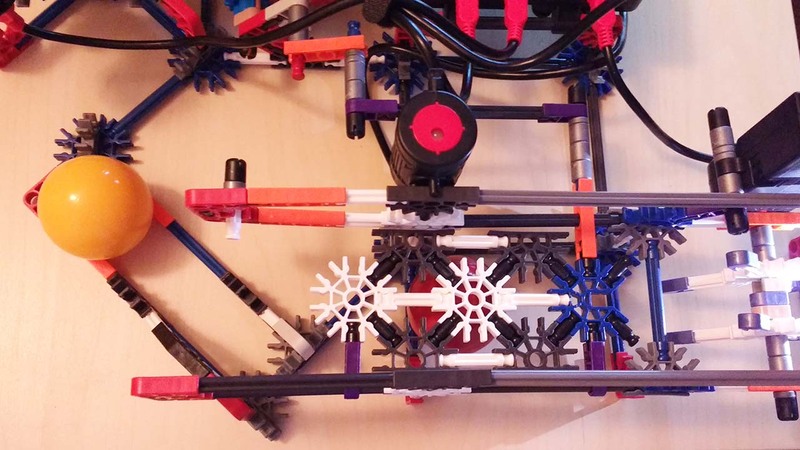 The Ball Factory is the biggest model from the K'Nex Robotics set and the one that requires the most independent coding. My son learned loads about robotics while building and programming this model. The mechanisms in the factory are very cleverly designed and worked well. My son could easily cope with the building himself. I helped to speed things up, but he's actually better at working out where things go when it gets more complicated. We had a real sense of achievement when the Ball Factory was all up and running and rejecting the red balls and sending the yellow ones on round.